Provincetown was settled by seafarers. Many of those seafarers were fishermen who came from Portugal, often as dory men, a particularly perilous form of an already dangerous but necessary profession. In 1947 two local men learned of a ceremony in Gloucester, MA that supported and honored the fishing community. Domingos Godinho and Arthur Bragg Silva vowed to bring a similar celebration to Provincetown. 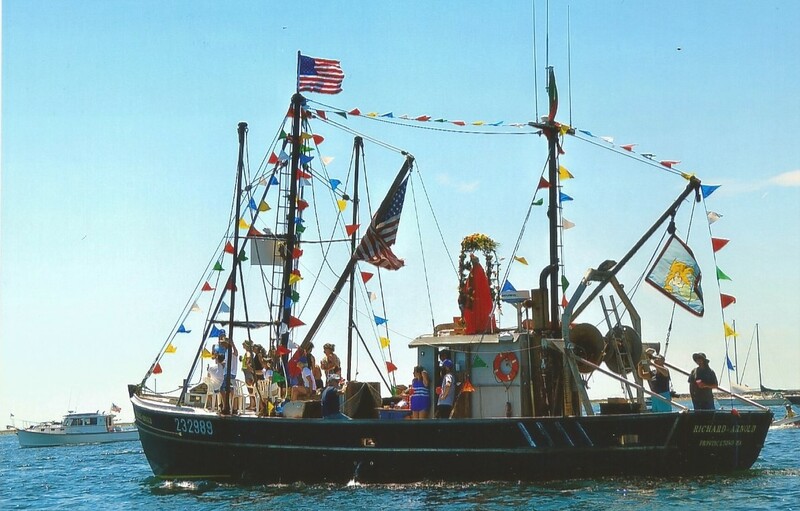 Thus, the first annual Blessing of the Fishing Fleet took place in 1948 and has been going strong ever since. The crux of the event is a Mass followed by a procession to MacMillan pier lead by a statue of St. Peter carried on the shoulders of four fishermen. At the end of the pier, each boat is blessed for a safe and prosperous season. While the dynamics of the town and its industry change, this celebration continues and evolves. From parades, parties, feasts, dances and concerts, the weekend of the Blessing of the Fleet is a community event. But it is always anchored by the Mass and the blessing of local vessels. From the Most Reverend James L. Connolly, who presided over the first Blessing of the Fleet, to our current bishop the Most Reverend Edgar Moreira da Cunha, several bishops have joined our parish priest to offer the blessing. The fishermen’s Mass is held on the last Sunday in June and has become a call home to many who grew up in Provincetown and Truro. This Mass continues to be filled with descendants of fishermen of long ago, families and individuals working the current fleet and many, many visitors who’s only connection to the ceremony is an appreciation of hard work, history, faith and support of those who have gone before us and those who rely on the sea.